Sports Illustrated has put together their Top 10 Super Bowl coaches of all time. There are a few surprises to me. I think Bill Walsh, Bill Parcells and Hank Stram could be higher but I’m not for sure who they would replace near the top. Does Joe Gibbs deserve to be 3#? I know he beat Shula but I would still place Don Shula a #9 instead of Weeb Ewbank. 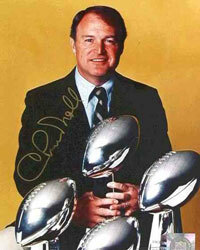 I’ve got no beef with Chuck Noll being #1.